Agoda—the largest and fastest-growing online hotel booking platform in Asia—is crazy about data. If you share their passion, join them as a data engineer in Bangkok! Our Bangkok team is looking for top quality passionate engineers to build products across our next-gen data platform products. Our systems scale across multiple data centers, totaling a few million writes per second and managing petabytes of data. We deal with problems from real-time data-ingestion, replication, enrichment, storage and analytics. We're not just using Big Data technologies—we're pushing them to the limit. In this competitive world of online travel agencies, finding even the slightest advantage in the data can make or break a company. That is why we put data systems in our top priorities. While we're proud of what we've built so far, there's still a long way to go to fulfill our vision of data. You can be part of designing, building, deploying (and probably debugging) products across all aspects of our core data platform products. A few of the technologies we use include Spray, Hadoop, Kibana, ElasticSearch, Yarn, Akka, Mesos, Kafka, Sensu, Redis, Scala, Python, Cassandra, Postgres, Spark, OpenStack, Logstash, Couchbase, Vertica, Grafana, Go. We are looking for people as excited about data technology as we are, to join the fight. If that's you, we want to see your application! You have a bachelor's degree in computer science, information systems, engineering, or another related field. 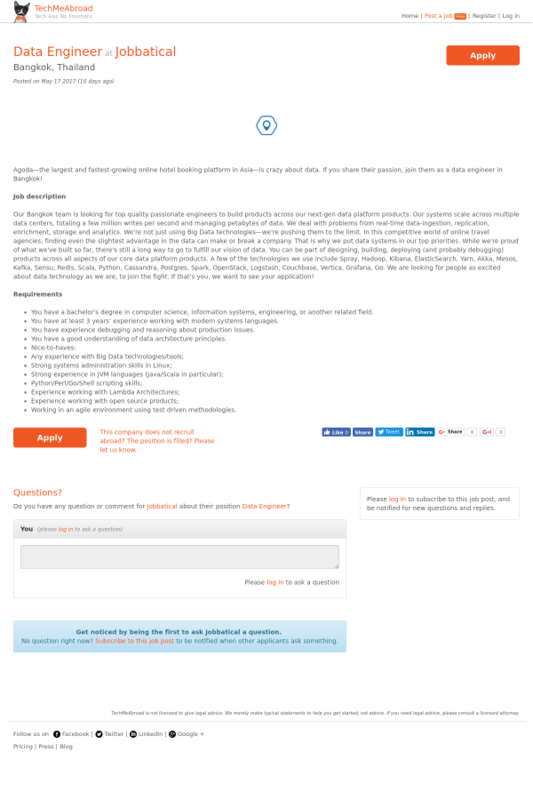 You have at least 3 years’ experience working with modern systems languages. You have experience debugging and reasoning about production issues. You have a good understanding of data architecture principles. Working in an agile environment using test driven methodologies. Do you have any question or comment for Jobbatical about their position Data Engineer ?